2. Arrange kale on a non stick baking sheet. 3. Very lightly coat kale with cooking spray and a bit of sea salt. 4. 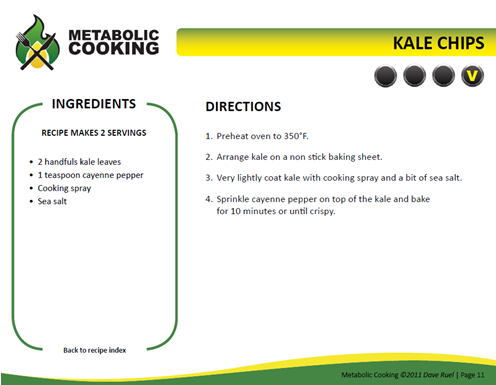 Sprinkle cayenne pepper on top of the kale and bake for 10 minutes or until crispy. This is my favorite! 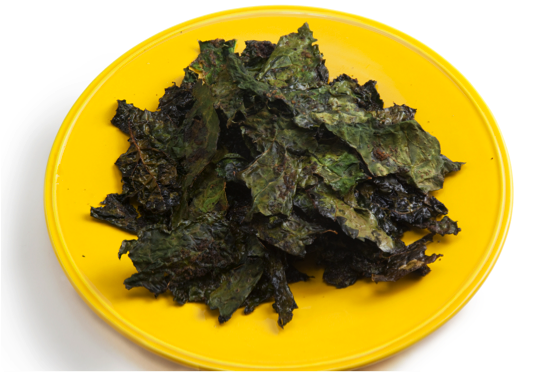 Love the kale chips, I eat them all the time! I know they are ADDICTIVE !!! I tried it and it was love at first bite !! so easy to make and so tasty ! I simply love them! haha!! I knew it !! It such a great alternative to potato chips and are soooo much better!!! I love these. I have to be careful not to overdo the cayenne sometimes but these are awesome. I have turned several of my friends onto this and have tried adding different spices/ seasoning onto them. Love how easy they are and how quick. I bought a little toaster oven for my office so I can make them fresh whenever I am craving a salty snack. Thank you so much for sharing.